Why did they change the regulations? What affect will the changes have on Home owners, Conservatories, Orangeries and extensions. The Government believes that transferring responsibility will provide the fairest, simplest and most efficient way to tackle problems faced by many householders. Householders were the owners of private sewers and lateral drains and were often unaware of their associated responsibilities and liabilities. Prior to 1st October 2011 access issues and disputes could be common, where a private sewer or drain serves a number of properties, blockages and ongoing maintenance could see neighbours at loggerheads over who should pay when there was a blockage somewhere along shared private pipe work. It used to lead to neighbourly disputes and end up with someone paying to get a blockage removed when they didn’t necessarily cause it in the first place. 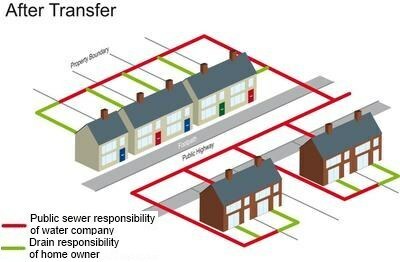 The transfer will stop the financial threat of customers being hit with huge repair bills for sewers that sometimes aren’t even on their property and the costs shared by all home owners. “Repair and maintenance of private sewers can be very expensive for householders and where drainage arrangements are shared between a number of households it can be difficult to recover costs from those who use the sewers but are unaffected by the problems. 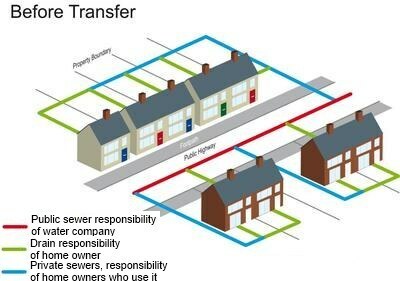 Regulations to transfer private sewers and drains in England and Wales to the water and sewage companies have been approved by Parliament and the Water Industry (Schemes for Adoption of Private Sewers) Regulations 2011 came into force on Friday, July 1 Ownership will transfer on October 1 and will apply to both residential and commercial properties. Water and sewerage companies will be responsible for private sewers and lateral drains that connect to the public sewer. What is the difference between a drain and a sewer ? Drains take foul sewage (waste from toilets, bathrooms and kitchens) and surface water (rain water) away from a single property. Homeowners will still be responsible for drains on their property. Lateral drains are the part of a drain outside the property boundary – for example, in a neighbour’s garden or in the highway. This means homeowners or occupiers will no longer be responsible for lateral drains and they will become the responsibility of the water and sewage companies. Sewers are shared drains. They take sewage and water away from more than one property, and will be the responsibility of the water and sewage companies. Firstly, as the sewers and drains are in private hands many water companies are unaware of the location of the pipes but will become immediately responsible for them on October 1. It may be some time until there is a comprehensive mapping record for all adopted sewers and drains. Secondly where a sewer is located within a property boundary, consent or a build over agreement from the water company will be required for any development over or in the vicinity of the sewer so property owners must be aware of this requirement before commencing works of any kind. What affect will the changes have on the home owners, Conservatories, Orangeries and Extensions. Home owners will no longer end up with neighbour disputes. Home owners will no longer be saddled with unexpected expensive repairs and maintenance bills, especially to drains not on their property. Home owners across the country will all share the cost of maintenance and repairs. Home owners can expect an estimated £3 to £14 rise in bills, that’s approximately £1 per month. Water companies will have statutory rights of access to a property on which there is a public sewer or drain. It will definitely mean that with more adopted sewers, so it follows there will be the requirement for more build over agreement applications. You will have a higher percentage of sewer issues and more build over agreements being turned down. In some situations you will probably find there is an easement distance of a minimum of 3 metres on public sewers, and you may not be permitted to build. You may have to inspect and take video footage of the existing drainage before and after any agreement work is carried out. If you get caught flaunting the laws you can end up in court and any structure built removed and the site returned to its original condition. Prevent the sewer collapsing. The extra weight of a new building above a sewer could cause the sewer to collapse, resulting in structural damage to the new building, interrupted drainage from other properties and waste water flooding. In these instances the sewer will need to be repaired quickly and this may involve taking down the building. Ensure they have access to carry out maintenance and repairs. You can find out whether there is a public sewer on your land by contacting your Local Authority office. Avoiding the sewer through modifications to your plans so that the buildings are at least 3 metres (or required regulatory distance) away from the sewer. This is often the easiest and cheapest option. Diverting the sewer. If your plans cannot be modified, they will usually require the sewer to be diverted. In most cases, they will have to carry out the work but at your expense. They will give you an estimate of the cost of the diversion, before any work commences. In most circumstances you may not be allowed to construct directly over a manhole or pressurised pumping main. If, having considered the alternatives your only option is to apply to build over a public sewer, you should make an application. In some circumstances, you may be allowed to build over a sewer, subject to the sewer being in satisfactory condition and written agreement is required before you start work. They may need to carry out a Closed Circuit Television (CCTV) survey before you begin work to ascertain whether any repair work is required, and another survey is required when your building is completed, to check that the sewer has not been damaged. If you have not obtained an agreement, in certain circumstances, they have the right to discontinue your works and the buildings erected over the public sewer may need to be taken down. They may not permit building over on new developments. Some minor public sewers serving a number of houses, often run along the back of older properties. As these may not show up on the sewer maps it is important that you contact them at an early stage if you suspect that a public sewer could be present. This would enable them to discuss and agree with you any necessary steps required to avoid problems in the future. There is a charge for every build over application. The level of charge will depend on the size of the sewer to be surveyed and whether a detailed investigation is necessary. If you suspect you are building on, or in the vicinity of a lateral drain or public sewer contact the local authority and get the relevant advice on how to proceed prior to the start of works, preferably as soon as the survey has taken place. Great post Steve. Everyone in the business needs to know about this! I would assume this would make the majority of people going for a conservatory or extension think twice, more so with the average home owner of a typical suburban property, with a limited budget, as most are. I agree with you in the respect that potentially more customers will have difficulties with lateral drains and sewers when building a conservatory or extension. Although in general a detached property will be unaffected and the first house on the drainage run of a semi detached houses will be unaffected. The terraced houses mid run would be affected with lateral drains being adopted, which could cause problems depending on their location to the proposed build. In general I think it will have an effect on the industry, but overall I believe home owners will be happier with the knowledge that they will not receive any unexpected massive bills for repairs and maintenance. Very informative, thanks Steve and Dave I am less concerned about the impact on future Conservatory installations now. The idea behind the post was to make people aware of the changes, so they don’t get caught out. The surveyors are the key role here in respect that they need to ensure they check and identify lateral drains and sewers that are now adopted. I still think it will cost the conservatory industry a bit of business where you won’t get a build over agreement. Thanks for the explanation Steve, I can see it more clearly now. Still think it is a shame though, just another complication to overcome though. Out of all bad things come some good. The good thing for the industry that will come out sewer work being regulated is the cowboys will no longer be able to flaunt the laws and the good companies will build up a reputation of carrying out a trouble free professional installation. One of the things we must try to do is turn the negative into a positive by using the new regulations as a sales aid, by asking customers. Good companies are always seen in a more professional light. Thanks for the update. I was honestly not aware of the changes in law and standards. Glad that I came through. When you are in a business, it is necessary to be updated about the latest updates in rules and regulations. And all thanks to people like you who keep an eye on them, and share with everyone. Unfortunately for the conservatory business and its potential customers the new regs did come into force on October 11th 2011, which has made it more difficult to install conservatories near and over sewers and drains. From a homeowner point of view, there are not so many homeowners going to be landed with lengthy repair costs and sewer ownership disputes as more of the sewer system has been adopted and is now owned by the water authorities. Very helpful post, Steve. We are looking to build a conservatory at our semi-detached over the drain. We are at the end of the drainage run so I have established that it is privately owned by us, with the neighbour’s drain, which ours runs into before it goes to the road, now seemingly being owned by Thames Water. The question I have is this: as we will be building within 3m of our neighbour’s fence, will we still require a build-over agreement, even though nothing within our property boundary is owned by Thames Water? The fact that you are building within 3M of the fence is irrelevant to the drainage situation, but may mean you have to apply for a party wall act. The best thing you can do for peace of mind re the drainage is, contact your local water authority, Thames Valley, and send them a plan view sketch of the site, they are pretty helpful in these situations. It is always better to check if any third party approvals are required before you build. The ones to check for are. Any Good Company builds and surveys a conservatory for you should always check what relevant permissions are required. Have a quick look at one of my previous articles on approvals are required. Hope this helps, best of luck with your conservatory Project. We are proposing on buying land, the water maps indicate a Lateral drain, storm chamber etc…..looking at this post I think I may leave it. I would contact the local water authority and ask them for advice before dismissing the property, build over agreements can be relatively simple in some cases, but each case is different.